Rub the steak with olive oil & heat a grill pan until very hot. Sear the steak on both sides for a few minutes, until done. Season with salt and black pepper and leave to rest. In food processor, add all the ingredients for the harissa paste – and blend until smooth. Your paste can last for up to four days in the fridge. In the meantime you can heat your oil in a saucepan for your caramelized onions, adding the onions by loosening their rings. Sauté for about 5 minutes on high until they change color. Turn down the heat, and cook for another few minutes until they become sticky and soft. Add the balsamic vinegar, mix, cook for one more minute and set aside. 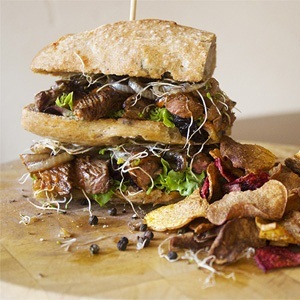 Slice your steak into slivers and assemble your sarmie to your liking.